A black-suited valet parker on Stuart drags a black lectern to its anchor spot outside a sit-down restaurant in San Francisco. A gardener weeds a planter box bending from the hip. A bicyclist standing by the curb bows to tell a car driver the way to the post office. for an hour of pulling and filling. For the first time in my life, my gums hurt. It’s a dull ache as if at night someone pounded away at them. I’m a Volunteer In Service to America on a subsistence monthly stipend of less than $200 in snowy, tree-lined Grand Rapids, Michigan. I turn to an old family remedy — I brush my teeth with added vigor, making sure to give each one a good going over. My gums turn red. The ache deepens, except when I sip black tea. But before long my heart says: "Stop! One more drop and I'll pop!" I moan about my gums to Karen. Surely, a few words of empathy will reduce the pain. But all she has to offer is: "You probably need to get your teeth cleaned." She shows me a strong set of teeth and healthy, pink gums. Karen is a volunteer from New Jersey. I try to mirror her smile. Maybe it comes off as a scowl. "Teeth cleaned?” I query. She gives me a calming smile. “Everyone in India brushes,” I explain. Her eyebrows ascend; the smile prevails. I feel I must get some acknowledgment from her that cleaning isn’t what I lack. “My father's in his sixties,” I say. “Still has all his teeth. How many Americans can say that? If he's brushing in the bathroom, you can hear him in the verandah. Neighbors in Bombay say they hear him downstairs and upstairs. I learned how to brush my teeth from him." That only gets me a bigger Karen smile. Was that all of New Jersey written large on it? "Not that type of cleaning," she says. "Go to the Junior College's Dental Clinic on Bostwick. You'll understand what I mean. I went last month. Got the best dental cleaning I've ever had." Karen smiles, but says no more. The Professor of Teeth shakes her head. “You obviously don’t have your dad’s teeth. Tell me about Mom’s,” she says, probing my aching gums. I squirm—not only because of the poking. “Mother’s teeth?” I ask, avoiding the no-nonsense professor’s eyes. The four-faced clock on the 245-foot tall Ferry Plaza tower in my beautiful San Francisco marks the hour four decades later and I think about the years I have and the years I don’t have. Hidden in the hollow between two buildings, a young man is staring at his cell phone, a cigarette smoking from his right hand. I cross The Embarcadero to the Tuesday Ferry Plaza Farmers’ Market to purchase a week’s supply of brassica. Vendors assure me that their broccoli, both dark and light green; cabbage, both green and purple; cauliflower, both white and orange; kale, both red and green; and Brussels sprouts are all pesticide free. AND GUARANTEED TO BE TASTY! I am ready for the years I still have. I buy both red and green kale and purple cabbage. 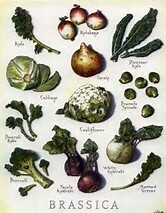 And venture once more into the breach with brassica. Michael Chacko Daniels lives and writes in San Francisco. He grew up in Bombay, where he attended St. Michael’s High School, Wilson College, and University of Bombay’s Department of Economics. He has a Master’s from Northwestern’s Medill School of Journalism. His parents grew up in an ancient Syrian Christian community in the South Indian state of Kerala. In their middle years, in Bombay, they joined the local Baptist Church out of conviction. His adventures in the United States include five years as a Volunteer In Service To America (VISTA); four as editor/publisher of the New River Free Press of Grand Rapids, Michigan; four as assistant editor in San Francisco at The Asia Foundation; and sixteen at Berkeley’s Center for independent Living. He helped start the Jobs for Homeless Consortium of Alameda County in 1988, and to run it through mid-2004. He is a naturalized citizen of the United States. Writers Workshop, Kolkata, has just published his latest novel: Savages and Other Neighbors. Several of the encounters in this novel first appeared in Hackwriters.